Sexual Harassment 'Trolls' Persist Even In The World Of Virtual Reality : All Tech Considered As gamers wade into virtual reality technology, recent allegations of in-game sexual harassment have surfaced some thorny questions: What does it look like in a virtual world, and how do you stop it? A woman tries on Google's virtual reality device "Daydream View" after the opening of Google's pop-up store in New York on October 20, 2016. In an instant, everything changes. Suddenly, all practical perception escapes, and in its place arises a fantastical world that teasingly mirrors the reality we call our own. It's called virtual reality, or VR, and it's this technology that game developer Jonathan Schenker has a passion for. 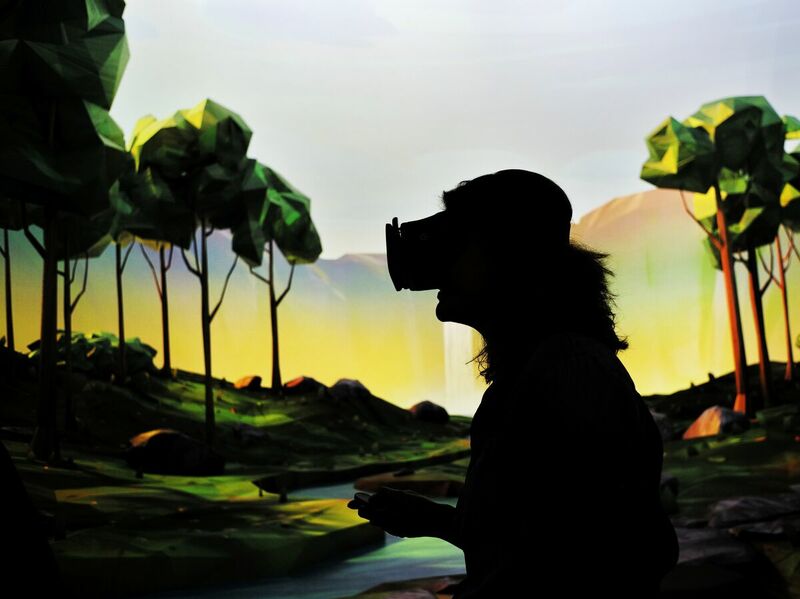 Schenker and his colleague Aaron Stanton created the VR game QuiVr — and, as he tells NPR's Rachel Martin, he was alarmed to discover a female user had been harassed while playing it. Writer Jordan Belamire describes how she was "groped" and "chased," while playing the medieval archery game, by a user called BigBro442. Belamire's story was originally posted on Medium before it was republished with permission on Mic. QuiVr features a multiplayer mode, a setting where real-time players from all walks of life are able to interact virtually with one another, allowing complete strangers like BigBro442 to interact with users like Belamire. "I was upset that the experience was ruined for her," developer Jonathan Schenker says. "The experience of virtual reality is really transportive — it puts you in that world and it's supposed to be an absolutely incredible experience and for a player to lose that experience, at the hand of another, really isn't appropriate, in my opinion. So I tried to fix it with the limited resources that I have." Prior to reading Belamire's story, Schenker and his fellow developers did initially have a "personal bubble," setting, a feature that aims to reduce minor annoyances from other players. So for more egregious instances like Belamire's experience, that personal bubble has now intensified, Schenker says. "Now ... if you have the setting on, someone who, kind of, walks into your personal space, simply fades out of existence," Schenker says. Jesse Fox, an assistant professor at Ohio State University, says experiences like the one Belamire describes is a result of unfortunate commonplace. "I find it unsurprising that sexual harassment has taken place in an immersive environment given what has happened in video games for several years," says Fox, who studies facets of communication like video games and social media. "It's a different manifestation of the same behavior. So whether it's being overly flirtatious in the workplace or putting your hand on someone's leg when they didn't want it — it's all unwanted sexual behavior driven by sexist tendencies." At the heart of the issue is a historical trend of exclusivity in a male-dominated space, Fox says. In late 2014, a debate manifested throughout the underbelly of the gaming community. It concerned two elements: video game journalism ethics and the role that women play within the genre. From Reddit posts to endless Twitter feeds, various gamers took aim at several women within the industry, including developers Zoë Tiberius Quinn and Brianna Wu. Under the hashtag #Gamergate, harassment campaigns were imposed against Quinn for her independently developed game called Depression Quest, along with negative speculations regarding her relationship with a past programmer. And a few years prior, feminist vlogger and gamer enthusiast Anita Sarkeesian was aggressively criticized after launching a campaign to fund her video series Tropes vs. Women in Video Games, a production that examined gender roles within the genre. It's a different manifestation of the same behavior. So whether it's being overly flirtatious in the workplace or putting your hand on someone's leg when they didn't want it — it's all unwanted sexual behavior driven by sexist tendencies. All three women, in varying degrees, reportedly received intense backlash, from abusive memes to unflinchingly cruel comments in social feeds. Overall, the Harvard Business School reports about 56 percent of women who start in the technology field leave mid-career, double the rate of men, in some cases based on instances of sexism in the workplace. To help combat the Internet trolls, as Jesse Fox calls them, Rep. Katherine Clark, D-Mass., has campaigned for more effective tactics for dealing with online harassment. Furthermore, organizations such as Crash Override Network assist with the creation of safe spaces for those who feel they've been attacked online. But there's still work to be done, Fox says. Because whether the industry is aware or not, "the adolescent teenage male gamer," is a thing of the past. At 31 percent, women age 18 or older represent a significantly greater portion of the game-playing population than the 17 percent that concerns men age 18 or younger, according to the Entertainment Software Association. Fox says QuiVr's response to Belamire's claim is one step in the right direction, and that women should not be disengaged from gaming just because there's some negative aspects. "I really appreciate what QuiVr has done," Fox says. "It's empowering users to decide when they're uncomfortable. That being said, trolls are trolls. And that's a little hard to deal with." Fox offers one piece of advice for those in the industry still trying to play catch-up. "Don't be on team troll."